Want a truly hip, unique, visually stimulating and classic with a modern flair location like no other? Here it is. Gone are the glory days of elaborate, angled neon blazing in the desert. But thanks to the Neon Boneyard in downtown Las Vegas, you can experience some of Sin City’s retired retro glitz, up close and personal. The 2 acre Boneyard boasts over 150 donated and rescued signs, ranging in period from the late 1930s to the early 1990s. Typophiles and neon junkies rejoice! Take home a piece of Las Vegas history, by taking home some of the most unique, dramatic, and stunning wedding photographs ever taken and add Neon Museum/The Sign Boneyard to your wedding or engagement package! Intimate Rock and Glow Experience $1295. 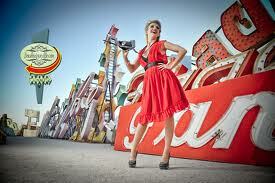 One hour professional photo shoot in the historic Neon Boneyard. Over 72 pictures and 10 high resolution images of your choice retouched by the photographer: suitable for prints up to 12 x 18 Ultra high quality or 36 x 48 normal quality. Neon Boneyard at the Neon Museum is located on the world famous Las Vegas Boulevard near downtown Las Vegas. The Boneyard is an extensive and impressive 2-acre outdoor collection of non-restored Las Vegas signs dating from the 1930′s to present day. The Signs represent motels, local businesses, and celebrated casino resorts from throughout the Las Vegas Valley. While the Boneyard is not electrified, the photogenic collection offers a glimpse into the storied past of Las Vegas and its most memorable art form; the Neon Sign. 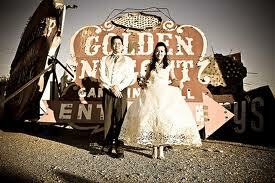 Before or after your fabulous Las Vegas wedding or as an engagement session, you can have a one-hour, private photo shoot at the Neon Museum/Boneyard. 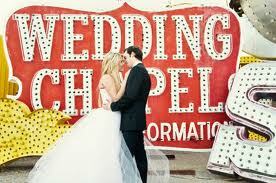 The Neon Museum/Boneyard is only available for photography (private appointment only) and not wedding ceremonies. Visions of Vegas Experience $1777. One hour professional photo shoot in the historic Neon Boneyard. 10 high resolution images of your choice retouched by the photographer: suitable for prints up to 12 x 18 Ultra high quality or 36 x 48 normal quality. Our professional Las Vegas photographers specialize in getting you great shots and memories to last a lifetime! 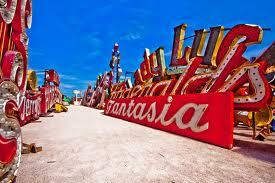 You can take home a piece of Las Vegas history by booking your Neon Museum/Sign Boneyard with us. The Sign Boneyard makes the perfect backdrop for both engagement and wedding photos. The Neon Museum collection boasts over 150 donated and rescued signs. The core of this collection is contained in the Neon Museum Boneyard, a rambling park approximately two acres in size. Signs featured date from the late 1930s through the early 90s and represent motels, local businesses, and celebrated casino resorts from throughout the Las Vegas Valley. While the Boneyard is not electrified, the photogenic collection offers a glimpse into the storied past of Las Vegas and its most memorable art form. Save money by doing your own videos, pictures andflowers or we’ll be happy to provide these services for you a la carte. 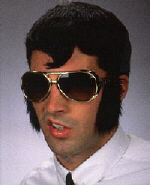 Add $100.00 for ELVIS to return you to your next destination in the Pink Cadillac or $149.00 for round trip. Book your Elvis or Pink Cadillac Experience now!